Our largest low vision wrist watch is back! This extra large watch has a 1.6" wide face within a 2" case, providing extra large visibility and clarity. 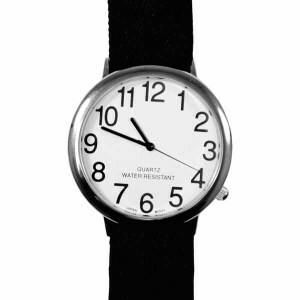 Bold black hands are features on a white face with bold black numbers so that you can read the time with ease. Stretch fabric band with hook and loop closure is extra easy to put on and take off. Stretch band is offered in 2 sizes: Large: 9.5" or Small: 8.2". Please specify.